Obama: "We are off to a good start. But it is just a start"
President Obama speaks at a news conference about his first 100 days in office. President Obama: Please, be seated. Before we begin tonight, I just want to provide everyone with a few brief updates on some of the challenges we're dealing with right now. First, we are continuing to closely monitor the emergency cases of the H1N1 flu virus throughout the United States. As I said this morning, this is obviously a very serious situation, and every American should know that their entire government is taking the utmost precautions and preparations. I've requested an immediate $1.5 billion in emergency funding from Congress to support our ability to monitor and track this virus and to build our supply of antiviral drugs and other equipment. And we will also ensure that those materials get to where they need to be as quickly as possible. you would take to prevent any other flu: keep your hands washed; cover your mouth when you cough; stay home from work if you're sick; and keep your children home from school if they're sick. We'll continue to provide regular updates to the American people as we receive more information. And everyone should rest assured that this government is prepared to do whatever it takes to control the impact of this virus. The second thing I'd like to mention is how gratified I am that the House and the Senate passed a budget resolution today that will serve as an economic blueprint for this nation's future. I especially want to thank Leader Reid, Speaker Pelosi, all of the members of Congress who worked so quickly and effectively to make this blueprint a reality. This budget builds on the steps we've taken over the last 100 days to move this economy from recession to recovery and ultimately to prosperity. But, even as we clear away the wreckage of this recession, I've also said that we can't go back to an economy that's built on a pile of sand, on inflated home prices and maxed-out credit cards, on overleveraged banks and outdated regulations that allow recklessness of a few to threaten the prosperity of all. We have to lay a new foundation for growth, a foundation that will strengthen our economy and help us compete in the 21st century. And that's exactly what this budget begins to do. It contains new investments in education that will equip our workers with the right skills and training, new investments in renewable energy that will create millions of jobs and new industries, new investments in health care that will cut costs for families and businesses, and new savings that will bring down our deficit. I also campaigned on the promise that I would change the direction of our nation's foreign policy. And we've begun to do that, as well. We've begun to end the war in Iraq, and we forged with our NATO allies a new strategy to target Al Qaeda in Afghanistan and Pakistan. We have rejected the false choice between our security and our ideals by closing the detention center at Guantanamo Bay and banning torture without exception. And we've renewed our diplomatic efforts to deal with challenges ranging from the global economic crisis to the spread of nuclear weapons. So I think we're off to a good start, but it's just a start. I'm proud of what we've achieved, but I'm not content. I'm pleased with our progress, but I'm not satisfied. Millions of Americans are still without jobs and homes, and more will be lost before this recession is over. Credit is still not flowing nearly as freely as it should. Countless families and communities touched by our auto industry still face tough times ahead. Our projected long-term deficits are still too high, and government is still not as efficient as it needs to be. We still confront threats ranging from terrorism to nuclear proliferation, as well as pandemic flu. And all this means you can expect an unrelenting, unyielding effort from this administration to strengthen our prosperity and our security in the second hundred days, in the third hundred days, and all of the days after that. You can expect us to work on health care reform that will bring down costs while maintaining quality, as well as energy legislation that will spark a clean-energy revolution. I expect to sign legislation by the end of this year that sets new rules of the road for Wall Street, rules that reward drive and innovation, as opposed to short-cuts and abuse. And we will also work to pass legislation that protects credit card users from unfair rate hikes and abusive fees and penalties. We'll continue scouring the federal budget for savings and target more programs for elimination. And we will continue to pursue procurement reform that will greatly reduce the no-bid contracts that have wasted so many taxpayer dollars. So we have a lot of work left to do. It's work that will take time, and it will take effort. But the United States of America, I believe, will see a better day. We will rebuild a stronger nation, and we will endure as a beacon for all of those weary travelers beyond our shores who still dream that there's a place where all of this is possible. I want to thank the American people for their support and their patience during these trying times, and I look forward to working with you in the next hundred days, in the hundred days after that, all of the hundreds of days to follow to make sure that this country is what it can be. And with that, I will start taking some questions. And I'll start with you, Jennifer. Question: Thank you, Mr. President. With the flu outbreak spreading and worsening, can you talk about whether you think it's time to close the border with Mexico and whether -- under what conditions you might consider quarantining, when that might be appropriate? Obama: Well, first of all, as I said, this is a cause for deep concern, but not panic. And I think that we have to make sure that we recognize that how we respond intelligently, systematically, based on science and what public health officials have to say, will determine in large part what happens. I've consulted with our public health officials extensively on a day-to-day basis, in some cases an hour-to-hour basis. At this point, they have not recommended a border closing. From their perspective, it would be akin to closing the barn door after the horses are out, because we already have cases here in the United States. We have ramped up screening efforts, as well as made sure that additional supplies are there on the border so that we can prepare in the eventuality that we have to do more than we're doing currently. But the most important thing right now that public health officials have indicated is that we treat this the same way that we would treat other flu outbreaks, just understanding that, because this is a new strain, we don't yet know how it will respond. So we have to take additional precautions, essentially, take out $1.5 billion, so that we can make sure that everything is in place should a worst-case scenario play out. I do want to compliment Democrats and Republicans who worked diligently back in 2005 when the bird flu came up. I was part of a group of legislators who worked with the Bush administration to make sure that we had beefed up our infrastructure and our stockpiles of antiviral drugs, like Tamiflu. And I think the Bush administration did a good job of creating the infrastructure so that we can respond. For example, we've got 50 million courses of anti-viral drugs in the event that they're needed. So, the government is going to be doing everything that we can. We're coordinating closely with state and local officials. Secretary Napolitano at the Department of Homeland Security, newly installed Secretary Sebelius of Health and Human Services, our acting CDC director, they are all on the phone on a daily basis with all public health officials across the states to coordinate and make sure that there's timely reporting, that if -- as new cases come up, that we're able to track them effectively, that we're allocating resources so that they're in place. The key now I think is to make sure that we're maintaining great vigilance, that everybody responds appropriately when cases do come up, and individual families start taking very sensible precautions that -- can make a huge difference. So wash your hands when you shake hands. Cover your mouth when you cough. I know it sounds trivial, but it makes a huge difference. If you are sick, stay home. If your child is sick, keep them out of school. To -- if you are feeling certain flu symptoms, don't get on an airplane, don't get on a -- any system of public transportation where you're confined and you could potentially spread the virus. So those are the steps that I think we need to take right now. But understand that because this is a new strain, we have to be cautious. If this was a strain that we were familiar with, then we might have to -- then I think we wouldn't see the kind of alert levels that we're seeing, for example, with the World Health Organization. OK? Deb Price of Detroit News. Where's Deb? On the domestic auto industry, have you determined that bankruptcy is the only option to restructure Chrysler? And do you believe that the deep cuts in plant closings that were outlined this week by General Motors are sufficient? Obama: Let me speak to Chrysler first because the clock is ticking on Chrysler coming up with a plan. I am actually very hopeful, more hopeful than I was 30 days ago, that we can see a resolution that maintains a viable Chrysler auto company out there. What we've seen is the unions have made enormous sacrifices on top of sacrifices that they had previously made. You've now seen the major debt holders come up with a set of potential concessions that they can live with. All of that promises the possibility that you can get a Fiat- Chrysler merger and that you have an ongoing concern. The details have not yet been finalized, so I don't know to jump the gun. But I am feeling more optimistic than I was about the possibilities of that getting done. With respect to GM, we're going to have another 30 days. They're still in the process of presenting us with their plans. But I've always said that GM has a lot of good product there and if they can get through these difficult times, and engage in some of the very difficult choices that they've already made, that they can emerge a strong, competitive, viable company. And that's my goal in this whole process. I would love to get the U.S. government out of the auto business as quickly as possible. We have a circumstance in which a bad recession compounded some great weaknesses already in the auto industry. And it was my obligation and continues to be my obligation to make sure that any taxpayer dollars that are in place to support the auto industry are aimed not at short-term fixes that continue these companies as wards of the state, but rather institutes the kind of restructuring that allows them to be strongly competitive in the future. I think we're moving in that direction. prudent and appropriate thing for Chrysler to do to engage in the filings that they -- that received some notice a while back because they had to prepare for possible contingencies. It's not clear that they're going to have to use it. The fact that the major debt-holders appear ready to make concessions means that, even if they ended up having to go through some sort of bankruptcy, it would be a very quick type of bankruptcy and they could continue operating and emerge on the other side in a much stronger position. So my goal is to make sure that we've got a strong, viable, competitive auto industry. I think some tough choices are being made. There's no denying that there's significant hardship involved, particularly for the workers and the families in these communities. And we're going to be coming behind whatever plan is in place to make sure that the federal government is providing as much assistance as we have to ensure that people are landing back on their feet, even as we strengthen these core businesses. Jake? Where's Jake? There he is. Question: Thank you, Mr. President. You've said in the past that waterboarding, in your opinion, is torture. Torture is a violation of international law and the Geneva Conventions. Do you believe that the previous administration sanctioned torture? Obama: What I've said -- and I will repeat -- is that waterboarding violates our ideals and our values. I do believe that it is torture. I don't think that's just my opinion; that's the opinion of many who've examined the topic. And that's why I put an end to these practices. I am absolutely convinced it was the right thing to do, not because there might not have been information that was yielded by these various detainees who were subjected to this treatment, but because we could have gotten this information in other ways, in ways that were consistent with our values, in ways that were consistent with who we are. I was struck by an article that I was reading the other day talking about the fact that the British during World War II, when London was being bombed to smithereens, had 200 or so detainees. And Churchill said, "We don't torture," when the entire British -- all of the British people were being subjected to unimaginable risk and threat. And then the reason was that Churchill understood, you start taking short-cuts, over time, that corrodes what's -- what's best in a people. It corrodes the character of a country. And -- and so I strongly believed that the steps that we've taken to prevent these kinds of enhanced interrogation techniques will make us stronger over the long term and make us safer over the long term because it will put us in a -- in a position where we can still get information. In some cases, it may be harder, but part of what makes us, I think, still a beacon to the world is that we are willing to hold true to our ideals even when it's hard, not just when it's easy. At the same time, it takes away a critical recruitment tool that Al Qaeda and other terrorist organizations have used to try to demonize the United States and justify the killing of civilians. And it makes us -- it puts us in a much stronger position to work with our allies in the kind of international, coordinated intelligence activity that can shut down these networks. So this is a decision that I'm very comfortable with. And I think the American people over time will recognize that it is better for us to stick to who we are, even when we're taking on an unscrupulous enemy. Obama: I believe that waterboarding was torture. And I think that the -- whatever legal rationales were used, it was a mistake. Question: Thank you, sir. Let me follow up, if I may, on Jake's question. Did you read the documents recently referred to by former Vice President Cheney and others saying that the use of so-called "enhanced interrogation techniques" not only protected the nation but saved lives? And if part of the United States were under imminent threat, could you envision yourself ever authorizing the use of those enhanced interrogation techniques? Obama: I have read the documents. Now they have not been officially declassified and released. And so I don't want to go to the details of them. But here's what I can tell you, that the public reports and the public justifications for these techniques, which is that we got information from these individuals that were subjected to these techniques, doesn't answer the core question. Which is, could we have gotten that same information without resorting to these techniques? And it doesn't answer the broader question, are we safer as a consequence of having used these techniques? So when I made the decision to release these memos and when I made the decision to bar these practices, this was based on consultation with my entire national security team, and based on my understanding that ultimately I will be judged as commander-in-chief on how safe I'm keeping the American people. That's the responsibility I wake up with and it's the responsibility I go to sleep with. And so I will do whatever is required to keep the American people safe. But I am absolutely convinced that the best way I can do that is to make sure that we are not taking short cuts that undermine who we are. And there have been no circumstances during the course of this first 100 days in which I have seen information that would make me second guess the decision that I have made. OK? Question: Thank you, Mr. President. I want to move to Pakistan. Pakistan appears to be at war with the Taliban inside their own country. Can you reassure the American people that if necessary America could secure Pakistan's nuclear arsenal and keep it from getting into the Taliban's hands or, worst case scenario, even al Qaeda's hands? Obama: I'm confident that we can make sure that Pakistan's nuclear arsenal is secure. Primarily, initially, because the Pakistani army, I think, recognizes the hazards of those weapons falling into the wrong hands. We've got strong military-to-military consultation and cooperation. I am gravely concerned about the situation in Pakistan, not because I think that they're immediately going to be overrun and the Taliban would take over in Pakistan. I'm more concerned that the civilian government there right now is very fragile and don't seem to have the capacity to deliver basic services: schools, health care, rule of law, a judicial system that works for the majority of the people. And so as a consequence, it is very difficult for them to gain the support and the loyalty of their people. So we need to help Pakistan help Pakistanis. And I think that there's a recognition increasingly on the part of both the civilian government there and the army that that is their biggest weakness. On the military side, you're starting to see some recognition just in the last few days that the obsession with India as the mortal threat to Pakistan has been misguided, and that their biggest threat right now comes internally. And you're starting to see the Pakistani military take much more seriously the armed threat from militant extremists. We want to continue to encourage Pakistan to move in that direction. And we will provide them all of the cooperation that we can. We want to respect their sovereignty, but we also recognize that we have huge strategic interests, huge national security interests in making sure that Pakistan is stable and that you don't end up having a nuclear-armed militant state. Obama: I'm not going to engage in -- in hypotheticals of that sort. I feel confident that that nuclear arsenal will remain out of militant hands. Question: Thank you, Mr. President. One of the biggest changes you've made in the first 100 days regarding foreign policy has had to do with Iraq. But do the large-scale -- there's large-scale violence there right now. Does that affect the U.S.'s strategy at all for withdrawal? And could it affect the timetable that you've set out for troops? Obama: Well, first of all, I think it's important to note that, although you've seen some spectacular bombings in Iraq that are a -- a legitimate cause of concern, civilian deaths, incidents of bombings, et cetera, remain very low relative to what was going on last year, for example. And so you haven't seen the kinds of huge spikes that you were seeing for a time. The political system is holding and functioning in Iraq. Part of the reason why I called for a gradual withdrawal as opposed to a precipitous one was precisely because more work needs to be done on the political side to further isolate whatever remnants of Al Qaeda in Iraq still exists. And I'm very confident that, with our commander on the ground, General Odierno, with Chris Hill, our new ambassador, having been approved and already getting his team in place, that they are going to be able to work effectively with the Maliki government to create the conditions for an ultimate transfer after the national elections. But there's some -- some serious work to do on making sure that how they divvy up oil revenues is ultimately settled, what the provincial powers are and boundaries, the relationship between the Kurds and the central government, the relationship between the Shia and the Kurds. Are they incorporating effectively Sunnis, Sons of Iraq, into the structure of the armed forces in a way that's equitable and just? Those are all issues that have not been settled the way they need to be settled. And what we've done is, we've provided sufficient time for them to get that work done, but we've got to keep the pressure up, not just on the military side, but on the diplomatic and development sides, as well. Question: Thank you, Mr. President. On Senator Specter's switch to the Democratic Party, you said you were thrilled; I guess nobody should be surprised about that. But how big a deal is this, really? Some Republicans say it is huge. They believe it's a game-changer. They say that, if you get the 60 votes in the Senate, that you will be able to ride roughshod over any opposition and that we're on the verge of, as one Republican put it, "one-party rule." Do you see it that way? And, also, what do you think his switch says about the state of the Republican Party? Obama: Well, first of all, I think very highly of Arlen Specter. I think he's got a record of legislative accomplishment that is as good as any member of the Senate. And I think he's always had a strong independent streak. I think that was true when he was a Republican; I think that will be true when he's a Democrat. He was very blunt in saying I couldn't count on him to march lockstep on every single issue. And so he's going to still have strong opinions, as many Democrats in the Senate do. I've been there. It turns out, all the senators have very strong opinions. And I don't think that's going to change. I do think that having Arlen Specter in the Democratic caucus will liberate him to cooperate on critical issues, like health care, like infrastructure and job creation, areas where his inclinations were to work with us, but he was feeling pressure not to. And I think the vote on the recovery act was a classic example. Ultimately, he thought that was the right thing to do. And he was fiercely berated within his own party at the time for having taken what I consider to be a very sensible step. So -- so I think it's, overall, positive. Now, I am under no illusions that suddenly I'm going to have a rubber-stamp Senate. I've got Democrats who don't agree with me on everything, and that's how it should be. Congress is a co-equal branch of government. Every senator who's there, whether I agree with them or disagree with them, I think truly believes that they are doing their absolute best to represent their constituencies. And we've got regional differences, and we've got some parts of the country that are affected differently by certain policies. And those have to be respected, and there's going to have to be compromise and give-and-take on all of these issues. I do think that, to my Republican friends, I want them to realize that me reaching out to them has been genuine. I can't sort of define bipartisanship as simply being willing to accept certain theories of theirs that we tried for eight years and didn't work and the American people voted to change. But there are a whole host of areas where we can work together. And I've said this to people like Mitch McConnell. I said, look, on health care reform, you may not agree with me that I -- we should have a public plan. That may be philosophically just too much for you to swallow. On the other hand, there are some areas like reducing the costs of medical malpractice insurance where you do agree with me. If I'm taking some of your ideas and giving you credit for good ideas, the fact that you didn't get 100 percent can't be a reason every single time to oppose my position. And if that is how bipartisanship is defined, a situation in which basically, wherever there are philosophical differences, I have to simply go along with ideas that have been rejected by the American people in a historic election, you know, we're probably not going to make progress. If, on the other hand, the definition is that we're open to each other's ideas, there are going to be differences, the majority will probably be determinative when it comes to resolving just hard, core differences that we can't resolve, but there is a whole host of other areas where we can work together, then I think we can make progress. Question: Is the Republican Party in the desperate straits that Arlen Specter seems to think it is? Obama: You know, politics in America changes very quick. And I'm a big believer that things are never as good as they seem and never as bad as they seem. You're talking to a guy who was 30 points down in the polls during a -- a primary in Iowa. So -- so I never -- I don't believe in crystal balls. I do think that our administration has taken some steps that have restored confidence in the American people that we're moving in the right direction and that simply opposing our approach on every front is probably not a good political strategy. Question: Thank you, Mr. President. In a couple of weeks, you're going to be giving the commencement at Notre Dame. And, as you know, this has caused a lot of controversy among Catholics who are opposed to your position on abortion. As a candidate, you vowed that one of the very things you wanted to do was sign the Freedom of Choice Act, which, as you know, would eliminate federal, state and local restrictions on abortion. And at that it was above -- quote, "above my pay grade." Now that you've been president for 100 days, obviously, your pay grade is a little higher than when you were a senator. Do you still hope that Congress quickly sends you the Freedom of Choice Act so you can sign it? Obama: You know, the -- my view on -- on abortion, I think, has been very consistent. I think abortion is a moral issue and an ethical issue. I think that those who are pro-choice make a mistake when they -- if they suggest -- and I don't want to create straw men here, but I think there are some who suggest that this is simply an issue about women's freedom and that there's no other considerations. I think, look, this is an issue that people have to wrestle with and families and individual women have to wrestle with. The reason I'm pro-choice is because I don't think women take that -- that position casually. I think that they struggle with these decisions each and every day. And I think they are in a better position to make these decisions ultimately than members of Congress or a president of the United States, in consultation with their families, with their doctors, with their doctors, with their clergy. So -- so that has been my consistent position. The other thing that I said consistently during the campaign is I would like to reduce the number of unwanted presidencies that result in women feeling compelled to get an abortion, or at least considering getting an abortion, particularly if we can reduce the number of teen pregnancies, which has started to spike up again. And so I've got a task force within the Domestic Policy Council in the West Wing of the White House that is working with groups both in the pro-choice camp and in the pro-life camp, to see if we can arrive at some consensus on that. Now, the Freedom of Choice Act is not highest legislative priority. I believe that women should have the right to choose. But I think that the most important thing we can do to tamp down some of the anger surrounding this issue is to focus on those areas that we can agree on. And that's -- that's where I'm going to focus. During these first 100 days, what has surprised you the most about this office? Enchanted you the most from serving in this office? Humbled you the most? And troubled you the most? Obama: Now let me write this down. Obama: I've got -- what was the first one? Obama: And what was the last one, humbled? Question: Humbled. Thank you, sir. Obama: All right. OK. Surprised. I am surprised compared to where I started, when we first announced for this race, by the number of critical issues that appear to be coming to a head all at the same time. You know, when I first started this race, Iraq was a central issue, but the economy appeared on the surface to still be relatively strong. There were underlying problems that I was seeing with health care for families and our education system and college affordability and so forth, but obviously, I didn't anticipate the worst economic crisis since the Great Depression. And so, you know, the typical president, I think, has two or three big problems. We've got seven or eight big problems. And so we've had to move very quickly and I'm very proud of my team for the fact that we've been able to keep our commitments to the American people, to bring about change, while at the same time managing a whole host of issues that had come up that weren't necessarily envisioned a year-and-a-half ago. Troubled? I'd say less troubled, but, you know, sobered by the fact that change in Washington comes slow. That there is still a certain quotient of political posturing and bickering that takes place even when we're in the middle of really big crises. I would like to think that everybody would say, you know what, let's take a time-out on some of the political games, focus our attention for at least this year, and then we can start running for something next year. And that hasn't happened as much as I would have liked. Enchanted? Enchanted. I will tell you that when I -- when I meet our servicemen and -women, enchanted is probably not the word I would use. 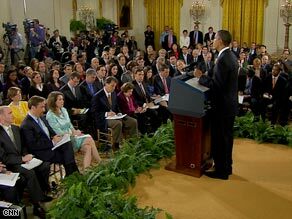 Obama: But I am so profoundly impressed and grateful to them for what they do. They're really good at their job. They are willing to make extraordinary sacrifices on our behalf. They do so without complaint. They are fiercely loyal to this country. And, you know, the more I interact with our servicemen and women, from the top brass down to the lowliest private, I'm just -- I'm grateful to them. Humbled by the -- humbled by the fact that the presidency is extraordinarily powerful, but we are just part of a much broader tapestry of American life, and there are a lot of different power centers. And so I can't just press a button and suddenly have the bankers do exactly what I want or, you know, turn on a switch and suddenly, you know, Congress falls in line. And so, you know, what you do is to -- is to make your best arguments, listen hard to what other people have to say, and coax folks in the right direction. This metaphor has been used before, but the ship of state is an ocean liner. It's not a speedboat. And so the way we are constantly thinking about this issue, of how to bring about the changes that the American people need, is to -- is to say, if we can move this big battleship a few degrees in a different direction, you may not see all the consequences of that change a week from now or three months from now, but 10 years from now or 20 years from now, our kids will be able to look back and say, "That was when we started getting serious about clean energy. That's when health care started to become more efficient and affordable. That's when we became serious about raising our standards in education." And -- and so I -- I have a much longer time horizon than I think you do when you're a candidate or if you're listening, I think, to the media reportage on a day-to-day basis. And I'm humbled, last, by the American people who have shown extraordinary patience and I think a recognition that we're not going to solve all of these problems overnight. Question: Thank you, Mr. President. Mr. President, when you met with the Hispanic Caucus a few weeks ago, reports came out that the White House was planning to have a forum to talk about immigration and bring it to the forefront. Going forward, my question is, what is your strategy to try to have immigration reform? And are you still on the same timetable to have it accomplished in the first year of your presidency? And, also, I'd like to know if you're going to reach out to Senator John McCain, who is Republican and in the past has favored immigration reform? Obama: Well, we reach out to -- to Senator McCain on a whole host of issues. He has been a leader on immigration reform. I think he has had the right position on immigration reform. And I would love to partner with him and others on what is going to be a critical issue. We've also worked with Senator McCain on what I think is a terrific piece of legislation that he and Carl Levin have put together around procurement reform. We want that moved, and we're going to be working hard with them to get that accomplished. What I told the Congressional Hispanic Caucus is exactly what I said the very next day in a town hall meeting and what I will continue to say publicly, and that is we want to move this process. We can't continue with a broken immigration system. It's not good for anybody. It's not good for American workers. It's dangerous for Mexican would-be workers who are trying to cross a dangerous border. It is -- it is putting a strain on border communities, who oftentimes have to deal with a host of undocumented workers. And it keeps those undocumented workers in the shadows, which means they can be exploited at the same time as they're depressing U.S. wages. So, what I hope to happen is that we're able to convene a working group, working with key legislators like Luis Gutierrez and Nydia Velazquez and others to start looking at a framework of how this legislation might be shaped. In the meantime, what we're trying to do is take some core -- some key administrative steps to move the process along to lay the groundwork for legislation. Because the American people need some confidence that if we actually put a package together, we can execute. So Janet Napolitano, who has great knowledge of this because of having been a border governor, she's already in the process of reviewing and figuring out how can we strengthen our border security in a much more significant way than we're doing. If the American people don't feel like you can secure the borders, then it's hard to strike a deal that would get people out of the shadows and on a pathway to citizenship who are already here, because the attitude of the average American is going to be, well, you're just going to have hundreds of thousands of more coming in each year. On the other hand, showing that there is a more thoughtful approach than just raids of a handful of workers as opposed to, for example, taking seriously the violation of companies that sometimes are actively recruiting these workers to come in. That's again something we can start doing administratively. So what we want to do is to show that we are competent and getting results around immigration, even on the structures that we already have in place, the laws that we already have in place, so that we're building confidence among the American people that we can actually follow through on whatever legislative approach emerges. OK? Obama: I see the process moving this first year. And I'm going to be moving it as quickly as I can. I've been accused of doing too much. We are moving full steam ahead on all fronts. Ultimately, I don't have control of the legislative calendar, and so we're going to work with legislative leaders to see what we can do. Andre Showell? There you go. As the entire nation tries to climb out of this deep recession, in communities of color, the circumstances are far worse. The black unemployment rate, as you know, is in the double digits. And in New York City, for example, the black unemployment rate for men is near 50 percent. My question to you tonight is given this unique and desperate circumstance, what specific policies can you point to that will target these communities and what's the timetable for us to see tangible results? Obama: Well, keep in mind that every step we're taking is designed to help all people. But, folks who are most vulnerable are most likely to be helped because they need the most help. So when we passed the Recovery Act, for example, and we put in place provisions that would extend unemployment insurance or allow you to keep your health insurance even if you've lost your job, that probably disproportionately impacted those communities that had lost their jobs. And unfortunately, the African-American community and the Latino community are probably overrepresented in those ranks. When we put in place additional dollars for community health centers to ensure that people are still getting the help that they need, or we expand health insurance to millions more children through the Children's Health Insurance Program, again, those probably disproportionately impact African-American and Latino families simply because they're the ones who are most vulnerable. They have got higher rates of uninsured in their communities. So my general approach is that if the economy is strong, that will lift all boats as long as it is also supported by, for example, strategies around college affordability and job training, tax cuts for working families as opposed to the wealthiest that level the playing field and ensure bottom-up economic growth. And I'm confident that that will help the African-American community live out the American dream at the same time that it's helping communities all across the country. Question: Thank you, Mr. President. During the campaign, you criticized President Bush's use of the state secrets privilege, but U.S. attorneys have continued to argue the Bush position in three cases in court. How exactly does your view of state secrets differ from President Bush's? And do you believe presidents should be able to derail entire lawsuits about warrantless wiretapping or rendition if classified information is involved? Obama: I actually think that the state secret doctrine should be modified. I think right now it's overbroad. But keep in mind what happens, is we come in to office. We're in for a week, and suddenly we've got a court filing that's coming up. And so we don't have the time to effectively think through, what exactly should an overarching reform of that doctrine take? We've got to respond to the immediate case in front of us. There -- I think it is appropriate to say that there are going to be cases in which national security interests are genuinely at stake and that you can't litigate without revealing covert activities or classified information that would genuinely compromise our safety. But searching for ways to redact, to carve out certain cases, to see what can be done so that a judge in chambers can review information without it being in open court, you know, there should be some additional tools so that it's not such a blunt instrument. And we're interested in pursuing that. I know that Eric Holder and Greg Craig, my White House counsel, and others are working on that as we speak. Obama: Jonathan Weisman, you get -- you get the last word. Where are you? There you are. Question: Thank you, sir. You are currently the chief shareholder of a couple of very large mortgage giants. You're about to become the chief shareholder of a car company, probably two. And I'm wondering, what kind of shareholder are you going to be? What is the government's role as the keeper of public -- public trust and bonds in -- in soon-to-be public companies again? Thank you. Obama: Well, I think our -- our first role should be shareholders that are looking to get out. You know, I don't want to run auto companies. I don't want to run banks. I've got two wars I've got to run already. I've got more than enough to do. So the sooner we can get out of that business, the better off we're going to be. We are in unique circumstances. You had the potential collapse of the financial system, which would have decimated our economy, and so we had to step in. As I've said before, I don't agree with every decision that was made by the previous administration when it came to TARP, but the need for significant intervention was there, and it was appropriate that we moved in. With respect to the auto companies, I believe that America should have a functioning, competitive auto industry. I don't think that taxpayers should simply put -- attach an umbilical cord between the U.S. Treasury and the auto companies so that they are constantly getting subsidies, but I do think that helping them restructure at this unique period when sales -- you know, the market has essentially gone from 14 million down to 9 million, I don't think that there's anything inappropriate about that. Obama: I don't think that we should micromanage, but I think that, like any investor, the American taxpayer has the right to scrutinize what's being proposed and make sure that their money is not just being thrown down the drain. And so, you know, we've got to strike a balance. I don't want to be -- I'm not an auto engineer. I don't know how to create an affordable, well-designed plug-in hybrid. But I know that, if the Japanese can design an affordable, well-designed hybrid, then, doggone it, the American people should be able to do the same. So my job is to ask the auto industry: Why is it you guys can't do this? And, in some cases, they're starting to do it, but they've got these legacy costs. You know, there are some terrific U.S. cars being made, both by Chrysler and G.M. The question is, you know, give me a plan so that you're building off your strengths and you're projecting out to where that market is going to be. I actually think, if you look at the trends, that those auto companies that emerge from this crisis, when you start seeing the pent-up demand for autos coming back, they're going to be in a position to really do well, globally, not just here in the United States. So I just want to help them get there. But I want to disabuse people of this notion that somehow we enjoy, you know, meddling in the private sector, if -- if you could tell me right now that, when I walked into this office that the banks were humming, that autos were selling, and that all you had to worry about was Iraq, Afghanistan, North Korea, getting health care passed, figuring out how to deal with energy independence, deal with Iran, and a pandemic flu, I would take that deal. And -- and that's why I'm always amused when I hear these, you know, criticisms of, "Oh, you know, Obama wants to grow government." No. I would love a nice, lean portfolio to deal with, but that's not the hand that's been dealt us. And, you know, every generation has to rise up to the specific challenges that confront them. We happen to have gotten a big set of challenges, but we're not the first generation that that's happened to. And I'm confident that we are going to meet these challenges just like our grandparents and forbearers met them before. All right? Thank you, everybody.